automobiles, trucks, motorcycles, scooters, ATVs, electrical generators, robotics, marine equipment, jets and jet engines, and lawn and garden equipment. Honda and Acura brands. Honda Motor Company, Limited (本田技研工業株式会社; Honda Giken Kōgyō; Kabushiki-gaisha; Honda Technology Research Institute Company, Limited), shortened to Honda is a multinational corporation, engine manufacturer and engineering corporation headquartered in Tokyo, Japan. Founded in 1946 as Honda Research Institute by Soichiro Honda, to develop small, fuel-efficient engines, the company was incorporated as Honda Motor Company in 1948. In 1949 it began producing motorcycles, and ten years later, the company had become the leading maker of motorcycles in the world. The American Honda Motor Company began producing motorcycles in Los Angeles in 1959. In 1963, Honda began production of automobiles. Today, Honda is the fifth largest automobile manufacturer in the world and the largest engine-maker, producing more than 14 million internal combustion engines each year. Honda maintains manufacturing and research facilities in numerous countries, and has also created joint ventures around the world, such as Honda of the UK Manufacturing Limited, Honda Siel Cars India Ltd, Hero Honda Motorcycles India Ltd, Dongfeng Honda Automobile Company in China and Honda Atlas Cars Pakistan. Honda is recognized for its technology and design initiatives, including the Compound Vortex Controlled Combustion (CVCC) engine, remarkable for its fuel efficiency and low emissions, and the first hybrid vehicle sold in North America. Honda Motor Company manufactures automobiles and motorcycles, trucks, scooters, robots, jets and jet engines, ATV, water craft, electrical generators, marine engines, lawn and garden equipment, and aeronautical and other mobile technologies. Honda's line of luxury cars are branded "Acura" in North America and China. More recently Honda has ventured into mountain bikes. Honda is headquartered in Tokyo, Japan. Its stock trades on the Tokyo Stock Exchange and the New York Stock Exchange, as well as exchanges in Osaka, Nagoya, Sapporo, Kyoto, Fukuoka, London, Paris and Geneva, Switzerland. American Honda Motor Co. is based in Torrance, California. Honda Canada Inc. is headquartered in Markham, Ontario, since 2008.Hero Honda, a joint venture between India's Hero Group and Honda, is the largest manufacturer of two wheelers in the world. Honda of Canada Manufacturing is based in Alliston, Ontario. Honda has also created joint ventures around the world, such as Honda Siel Cars India Ltd, Hero Honda Motorcycles India Ltd, Dongfeng Honda Automobile Company in China and Honda Atlas Cars Pakistan. Soichiro Honda, the founder of Honda Motor Company, Ltd., was fascinated by engines and automobiles as a child. At the age of 15, he became an apprentice at Art Shokai, an auto mechanic shop in Tokyo. Six years later he opened his own branch of Art Shokai, and at the same time became involved in building and driving race cars. In 1936, Honda set up “Tokai Seiki Heavy Industry” and began researching how to manufacture piston rings. He patented his technique in 1938 and began to supply Toyota and Nakajima Aircraft with mass-produced parts. During World War II, Tokai Seki manufactured engines for aircraft and for the Japanese navy. In 1945, Honda sold his business to Toyota and founded the Honda Technical Research Institute, which was incorporated in 1948 as Honda Motor Company. Honda used his engineering experience, acquired at Tokai Seiki, to develop and produce light motor cycles, powered by small, highly-efficient engines. In 1948, he entered into a partnership with Fujisawa Takeo, who shared his interest in long-term investment. Fujisawa Takeo oversaw the company's finances and marketing operations, while Honda concentrated on technological development. Several times, their efforts at expansion brought Honda Motor Company close to financial collapse, but by 1959, the company had become the leading maker of motorcycles in the world. Honda rejected conventional Japanese management techniques and promoted “the Honda way,” which emphasized personal initiative and depended on a close relationship between workers and management. He constantly asked his employees for their opinions and listened to their ideas. This freedom to express opinions openly contributed to the Honda Motor Company’s success. In the early 1960s, when the Japanese Ministry of International Trade and Industry was trying limit the automotive industry by merging Japan’s ten automotive manufacturers into three major companies (Nissan, Toyota and one minicar manufacturer), Honda decided to begin the production of automobiles. Honda defiantly introduced the S360 sports car in 1963, and by the early 1980s had become the third largest Japanese automaker. Honda personally tested the new models of motorcycles and cars until shortly before he retired as company president in 1973. Honda chose the United States as its first target export market, and in 1959, opened its first storefront in Los Angeles, with six employees. The Japanese government interfered by restricting the amount that could be invested outside of Japan. When Honda motorcycles, driven at higher speeds and for longer distances in the U.S., began to blow gaskets and lose clutches, Honda brought them back to Japan and used his investment capital to re-engineer them. By 1963, Honda had become the top-selling motorcycle in the United States. Honda opened its first U.S. motorcycle plant in 1979 and began producing automobiles in 1982. Today, Honda directly employs more than 25,000 Americans; and more than 100,000 workers are employed at authorized Honda automobile, motorcycle and power-equipment dealerships in the United States. Tens of thousands of additional Americans are employed by more than nearly 600 U.S. suppliers from which Honda purchases parts and materials. Honda produces a diverse lineup of automobiles under the Honda and Acura nameplates, motorcycles, ATVs, power products, marine engines, personal watercraft, mountain bikes, electrical generators, lawn and garden equipment, and aeronautical and other mobile technologies. Following its corporate philosophy of "Respect for the Individual," Honda participates in a number of philanthropic initiatives, focused on youth and education, and science and technology. From its early years, Honda Motor Company recognized that it must succeed in Europe in order to establish itself as a global company. Following its policy of producing its products in the regions where there is a demand for them, Honda began a collaboration with the partially state-owned British Rover Group (British Leyland Limited) in 1979. In 1985, a site was purchased in Swindon, and in 1989, Honda of the UK Manufacturing Limited (HUM) began producing units for the Honda Concerto (produced under license agreement by Rover at Longbridge) and Rover 200/400 Series. The facility incorporates its own foundry for the melting of aluminum ingots for cylinder heads and blocks, and its engine plant is capable of producing 1000 units per day. In 1992, HUM opened its first car plant, with a production capacity of 150,000 cars per year, operating on a two-shift basis. It is currently producing the CR-V model which is sold in the UK, mainland Europe and is also exported to North America. A second plant, completed in 2001, increased the annual production capacity from 150,000 to 250,000 units, and began production of the Civic 5-Door model on July 21, 2001. Honda Racing Corporation (HRC), formed in 1982, combines participation in motorcycle races throughout the world with the development of high-potential racing machines. Its racing activities are an important source for new technologies used in the development of Honda motorcycles. HRC also contributes to the advancement of motorcycle sports through a range of activities that include production and sales of racing motorcycles, support for satellite teams, and rider education programs. Soichiro Honda, being a race driver himself, realized that achieving fame in motor sports would automatically establish a reputation for Honda motorcycles and automobiles. In 1959, Honda entered five motorcycles into the Isle of Man TT race, at that time the most prestigious motorcycle race in the world. Though Honda engines were powerful, it was not until 1961 that Mike Hailwood claimed the first Honda Grand Prix victories in the 125 and 250 cc classes. Hailwood later picked up Honda’s first senior TT wins in 1966 and 1967. Honda's race bikes were known for their "sleek and stylish design" and exotic engine configurations, such as the 5-cylinder, 22,000 rpm, 125 cc bike and their 6-cylinder 250 cc and 380 cc bikes. In 1979, Honda returned to Grand Prix motorcycle racing with its exotic, monocoque-framed, four-stroke NR500. In an attempt to comply with the Fédération Internationale de Motocyclisme rules, which limited engines to four cylinders, the NR500 featured elongated cylinders, each with 8 valves and with connecting rods in pairs, to provide the valve area of an 8-cylinder engine. The experiment failed. For the 1982 racing season, Honda debuted their first two-stroke race bike, the NS500; and in 1983, Honda won their first 500 cc Grand Prix World Championship with Freddie Spencer. Since then, Honda has become a dominant player in motorcycle Grand Prix. In motocross, Honda has claimed 24 motocross world championships. Honda entered Formula One for the first time as a constructor in the 1964 season at the German Grand Prix with Ronnie Bucknum at the wheel. Richie Ginther, added to the team in 1965, scored Honda's first point at the Belgian Grand Prix, and Honda's first win at the Mexican Grand Prix. Honda won again in the 1967 Italian Grand Prix|Italian Grand Prix]], with John Surtees as the driver. In 1968, Jo Schlesser was killed in a Honda RA302 at the French Grand Prix. This racing tragedy, coupled with their commercial difficulties selling automobiles in the United States, prompted Honda to withdraw from all international motorsport that year. Honda-powered Brabhams dominated the 1966 French Formula Two championship, driven by Jack Brabham and Denny Hulme. In the early 1980s Honda returned to F2, supplying engines to Ron Tauranac's very successful Ralt team. In 1988, Bobby Rahal won one race at Pocono using a turbo "Brabham-Honda" engine, produced by John Judd's Engine Developments company for use in IndyCar racing. Honda returned to Formula One in 1983, with another Formula Two partner, the Spirit team, before switching abruptly to Williams in 1984. In the late 1980s and early 1990s, Honda-powered cars won six consecutive Formula One Constructors Championships. WilliamsF1 won the crown in 1986 and 1987. New partners Team McLaren won the title in 1988, 1989, 1990 and 1991. Honda withdrew from Formula One at the end of 1992, although the related Mugen-Honda company maintained a presence until the end of 1999, winning four races with Ligier and Jordan Grand Prix. Honda debuted in the CART IndyCar World Series as a works supplier in 1994. The engines were far from competitive at first, but after development, the company powered six consecutive drivers' championships. In 2003, Honda transferred its effort to the rival IRL IndyCar Series. In 2004, Honda-powered cars overwhelmingly dominated the IndyCar Series, winning 14 of 16 IndyCar races, including the Indianapolis 500, and claimed the IndyCar Series Manufacturers' Championship, Drivers' Championship and Rookie of the Year titles. In 2006, Honda became the sole engine supplier for the IndyCar Series, including the Indianapolis 500. The 2006 Indianapolis 500, for the first time in Indianapolis 500 history, was run without a single engine problem. In 1998, Honda returned to Formula One as an official engine supplier to British American Racing (BAR) and Jordan Grand Prix. 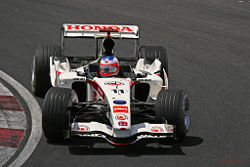 Honda bought a stake in the BAR team in 2004, and bought the team outright at the end of 2005, becoming a constructor for the first time since the 1960s. Honda won the 2006 Hungarian Grand Prix with driver Jenson Button. Honda has also built a Downhill racing bike, known as the Honda RN-01, with a gearbox, which replaces the standard Derailleur found on most bikes. Honda has taken on several riders, including Greg Minnaar, to pilot the bike. The team is known as Team G Cross Honda. During the 1960s, when it was a small manufacturer, Honda broke out of the Japanese motorcycle market and began exporting to the US. The story of Honda’s entry as a smaller manufacturer into a new market already occupied by highly dominant competitors, and its subsequent success in the U.S. and internationally, has become the subject of academic analysis. Various attempts have been made to explain Honda’s strategy and the reasons for its success. In 1975, Boston Consulting Group (BCG) was commissioned by the government of the United Kingdom to write a report explaining why and how the British motorcycle industry had been dominated by its Japanese competitors. The report concluded that the Japanese firms, including Honda, had aimed for large-scale production, making a large quantity of motorbikes, in order to benefit from economies of scale and learning curve effects. It blamed the decline of the British motorcycle industry on the failure of British managers to invest enough in their businesses to profit from economies of scale and scope. In 1984, Richard Pascale interviewed the Honda executives responsible for the firm’s entry into the US market, and concluded that the story of Honda’s entry into the US market was one of “miscalculation, serendipity, and organizational learning.” He attributed Honda’s success to the adaptability and hard work of its staff, rather than to any long-term strategy. For example, Honda initially planned to compete in the U.S. market with large 300 cc. motorcycles. When their employees found that the scooters they were using to get around San Francisco attracted positive interest from consumers, they came up with the idea of selling the Supercub instead. In 1989, Gary Hamel and C. K. Prahalad used Honda as an example of their concept of core competencies, arguing that Honda’s success was due to its focus on leadership in the technology of internal combustion engines. For example, the high power-to-weight ratio engines Honda produced for its racing bikes provided technology and expertise which was transferable to mopeds. Its first entrance into the pickup segment, the light duty Ridgeline, won Truck of the Year from Motor Trend magazine in 2006, the same year that the redesigned Civic won Motor Trend Car of the Year. Although a relatively small manufacturer compared to the other Japanese automakers, Honda is the largest engine maker in the world. Honda has produced a number of firsts in many categories, including the first engine to meet the 1970 US Clean Air Act (1975 CVCC), the first luxury Japanese car (1987 Legend) and motorcycle (2006 Gold Wing bikes) equipped with an airbag, and the first mid-size pickup truck with independent rear suspension (2006 Ridgeline). Honda has also pioneered new technology in its HA-420 HondaJet that reduces operating costs with diminished drag, improved aerodynamics and fuel efficiency. ASIMO is the part of Honda's Research & Development robotics program. It is the eleventh in a line of successive builds starting in 1986 with Honda E0, and moving through the ensuing Honda E series and the Honda P series. Weighing 54 kilograms and standing 130 centimeters tall, ASIMO resembles a small astronaut wearing a backpack, and can walk on two feet in a manner resembling human locomotion, at up to 6 km/h (3.7 mph). It is the world's only humanoid robot able to ascend and descend stairs independently. 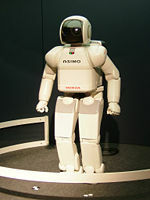 However, human motions such as climbing stairs are difficult to mimic with a machine, which ASIMO has demonstrated by taking two plunges off of a staircase. In 1974, Honda introduced the ingeniously simple Compound Vortex Controlled Combustion (CVCC) engine, remarkable for its fuel efficiency and low emissions. Honda produced the first hybrid vehicle sold in North America, and the first government-certified fuel-cell car. The Honda Civic Hybrid is able to achieve 45 miles per gallon. Honda Motor Company, Ltd. is responding to the world energy crisis and by developing a new generation of hybrid vehicles that are both fuel-efficient and affordable, including a 5-door hatchback, a hybrid version of its Fit. , and a unique small hybrid vehicle based on the CR-Z sports car concept that it introduced at the 2007 Tokyo Motor Show. Guadalajara, Jalisco—Engines, CR-V SUV (50,000 units per year). ↑ Honda in America: Philanthropy. Retrieved June 23, 2008. ↑ Official websiteworld.honda.com. Retrieved July 17, 2008. ↑ Honda Europe - Gent (HTML). Retrieved 2008-05-18. Aritake, Toshio. Honda's Midlife Crisis: Honda's slipping market position and views of Fukui Takeo, Chief Executive magazine, December 2005. Retrieved June 23, 2008. Mair, Andrew. 1999. Learning from Japan? : interpretations of Honda Motors by strategic management theorists. Nissan occasional paper series, no. 29. Oxford, UK: Nissan Institute of Japanese Studies. This page was last modified on 13 January 2018, at 17:31.